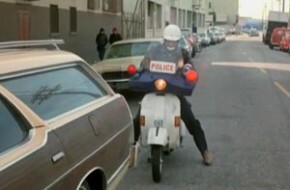 Vespa product placement from the early 80s: a P200E guest stars on Hill Street Blues. You may not remember a time when scooter sightings in the media were rare, but back in 2sb’s ‘zine days (the mid-90s), a vintage scooter appearing in a commercial would set Usenet ablaze with excitement. This appearance (from 1983) would have come at a time when Vespa was active in the U.S. but struggling against falling gas prices, and Honda’s just-unveiled more modern 4-stroke scooters. Within a year, with help from Lou Reed, Devo, Grace Jones, and Adam Ant, Honda would dominate the market. With the added complications of new emissions laws in California, Piaggio abandoned the market a couple years later, not returning until 1999. Was this appearance a deliberate marketing move, or a writer’s whim? Hard to say, but at this point, it’s likely Piaggio was seeking out any mass-media attention they could get, and law enforcement would have been an attractive market, indeed many police agencies did use Vespas for parking enforcement at the time, (and is that an Ape in the background?) On the other hand, the scooter is not particularly glorified, the officer riding it is humiliated on several occasions. This was the first part of a three-part series, if you can sit through them all, let me know if the scooter appears again in parts II or III.